Purple captained by Adam Boag lost the toss and bowled first on the beautiful and lightning fast ground at Marske CC. 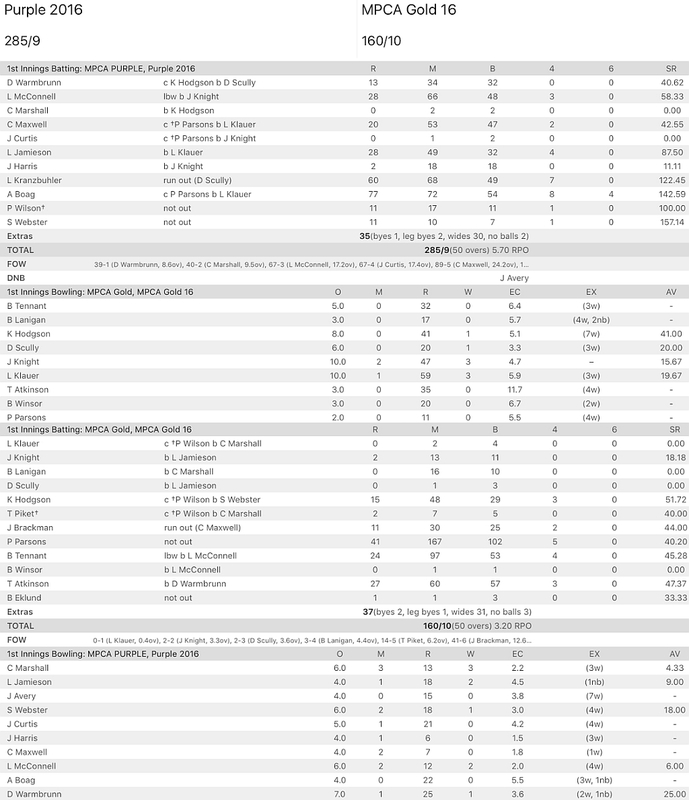 The home side ended their innings on 114 having been bowled out in the last over of this 20/20 fixture. Marske guest player Jack Curtis powered his way to a top score of 35 in the innings with some monster 6`s and hard hit drives down the ground as he took the game by the neck and led the hosts through their innings. Harvey for the hosts made a well compiled 21 but our lads bowled nicely, very accurately and indeed to some well set fields. Lach Jamieson continued his good form with the ball with 2/4 from 3 over’s and the popular Darcy Warmbrunn 2/12 from 2.2 over’s. The visitors really fielded well giving their best performance in the field to date. Jack Harris 1/10 from 3 over’s with the new ball really set the game up for the Purple team whilst the parents enjoyed the very generous hospitality of the home team. Sam Webster had a much deserved change of fortune to pick up the wicket of Harvey and his 2/0/11/1 were good reward for some accurate and flighted leg spin on a ground which could have been very unforgiving had he strayed in line and length. 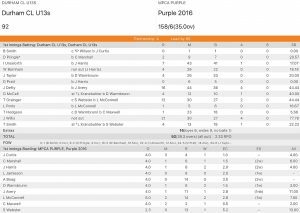 In return the Purple team smashed the older bowlers from the opposition to pass the total only 4 wickets down in the 15th over. Adam Boag again with 6 x 4 destroyed the bowling attack to finish 42 not out after Jonah Avery batted nicely against the new ball for his 14. Jonah has been a quite achiever to date and has done well throughout the tour with both bat and ball. After an initial quick wicket the Avery / Boag partnership really set the game up for the visitors. Sam Webster added 13 to the score before making way for the talent of Patrick Wilson. Whilst to date Patrick hasn’t has the volume of runs he would have liked, again his 15 today was full of class and it was a pity he fell just before the winning runs were hit just after 8pm. Both teams sacrificed their sightseeing days to play an extra fixture in a hastily arranged game at Crook CC. Coming to the end of the tours it was interesting to see how both groups had progressed during their time away. 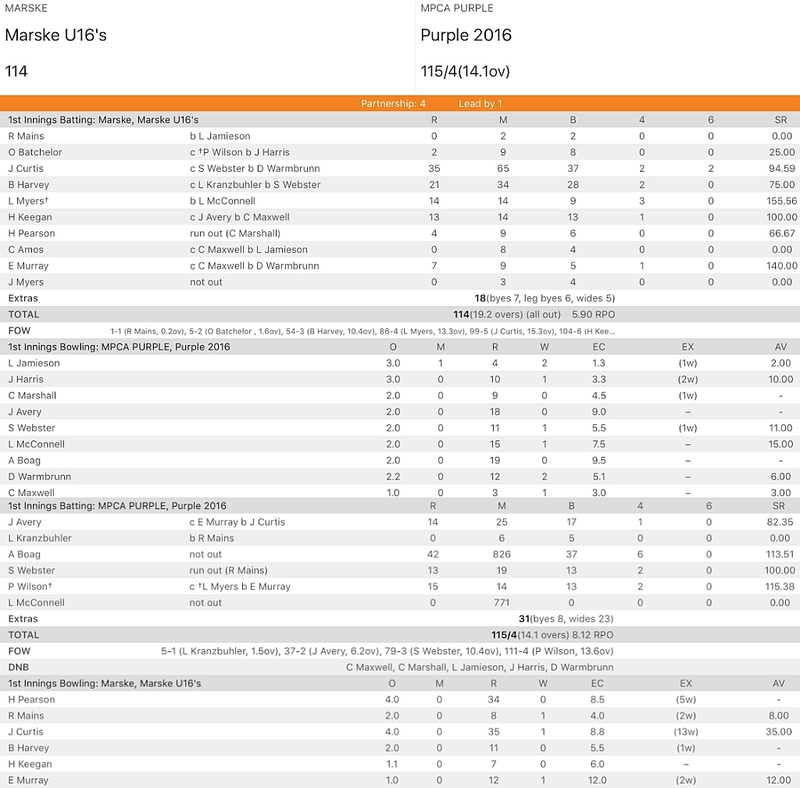 Purple won the toss and elected to bat and were quickly underway with Darcy Warmbrunn and Lucas McConnell taking the score quickly to 39 before Darcy was caught for 13. The reliable Marshall followed very quickly stuck on the crease to be dismissed for 0 and when run machine Maxwell followed soon after for 20 and big hitting Jack Curtis out second ball the Gold team were up and about with purple on the brink of falling over at 5/122 at drinks in this 50 over game. 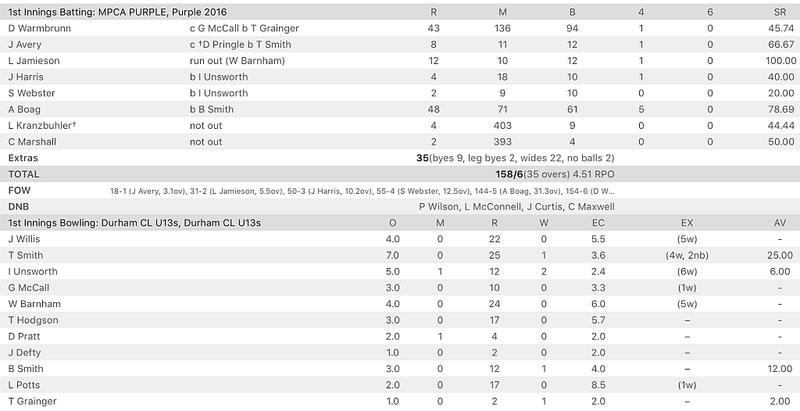 Jack Knight continued his impressive tour with another 3 wickets and was ably supported by Lach Klauer as the pair added three wickets each to their figures to finish with 3/47 & 3/59 respectively. Unfortunately for the Gold team their bowling was very ill disciplined as they conceded some 30 wides in their innings as Purple regained a foothold on the innings. 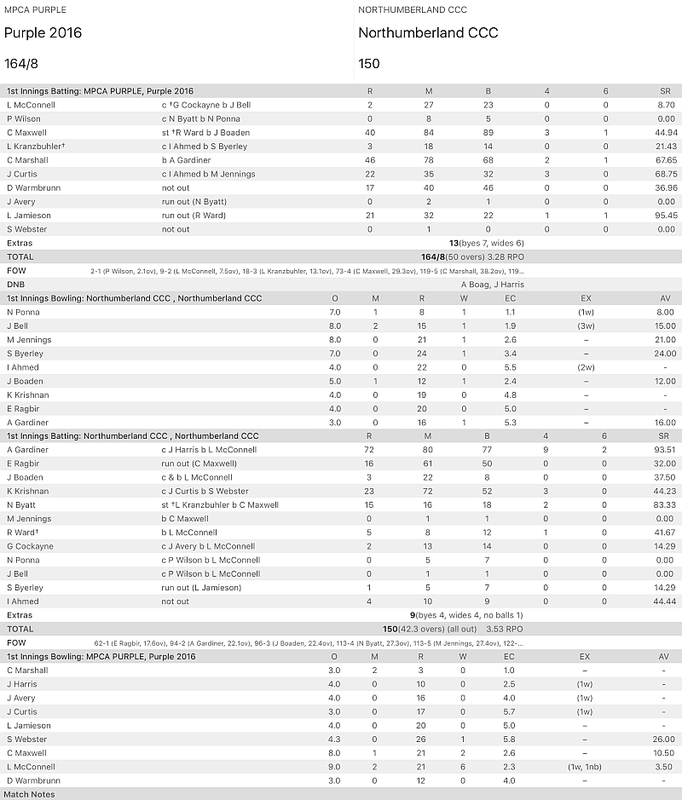 The very classy Luke Kranzbuhler added 60 coming in at 8 and the arrival of Adam Boag at 9 proved a killer blow for the Gold team as Boag cut lose to finish 77 not out of only 54 balls which included 8 x 4 and 4 X 6. His devastating hitting saw the Purple team close at 9/285. Gold team were never in the chase as Marshall tore into the top order claiming 3/13 from his 6 over’s and Lach Jamieson 2/18 from 4. At 5/14 the Gold team weren’t destined to recover however Patrick Parsons (41) and Ben Tennant (24) offered strong resistance later on in the innings with the Tiana Atkinson offering strong late support to finish 27 not out from her 57 deliveries faced. The Gold team were eventually dismissed for 160 with Purple team bowling a disappointing 31 wides in their innings. In the first of back to back fixtures at Crook CC the boys took on the mixed age range team from the local comprehensive school. Darcy was captain and elected to bat having won the toss. Jonah Avery survived an early life to make a well compiled 54 and shared a 105 partnership with Sam Webster (44). The dangerous Adam Boag again showed his awesome power hitting 6 x 4 in his 36 before trying once too often to hit the leg side boundary and was bowled. 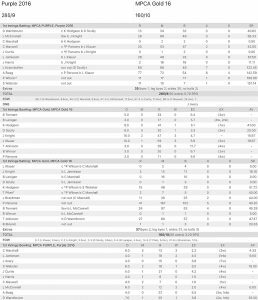 Four low scores followed before Charlie Maxwell whacked 27 off 10 balls with shots that were as classy as they were effective. 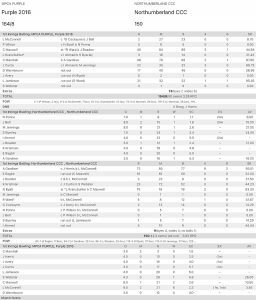 The innings closed on 8/219 from 40 over’s and whilst the score was very competitive I felt we were 30 short of where we could have been. The schools openers were positive in response and they raced to 55 for the opening partnership before Josh Holmes was bowled by Jonah Avery, who followed up his runs with a couple of wickets from his 4 overs. Sadly the rest of the team didn’t prove too much of challenge as some disciplined bowling matched with high quality fielding meant the school boys fell to 83 all out. Corey Marshall bowled with good pace and hit the stumps twice in his second spell (2/23) Lach McConnell chipped in with a couple of wickets (4-1-10-2) as his accurate off spin was too much to handle on a turning pitch. The result whilst comfortable, allowed most of the team to either bat or bowl and plenty of lessons are being learned by our boys which will hold them all in good stead for the games ahead. Without shadow of doubt our best and closest game of the tour to date. Having won the toss at Crook CC we decided to bat. Progress was slow and tight bowling from the opposition mixed with some tidy fielding saw us score off only 6 balls in the first 10 over’s. Openers McConnell & Wilson fell cheaply and skipper Charlie Maxwell was digging in and eventually fell for a well made 40. Corey Marshall offered solid support throughout the middle of the innings after Luke Kranzbuhl went cheaply. Corey copped a beauty to be dismissed for an excellent 40. 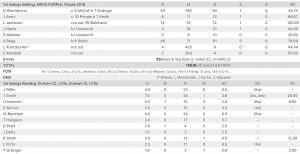 Jack Curtis whacked 22 and Darcy Waarmbrunn finished 17 not out and had a tidy little partnership towards the end of the innings with Lach Jamieson (21) as the innings closed on a very respectable 8/164. In reply the impressive Gardiner opened the innings for the visitors and threatened to take the game away from us with an outstanding 72 off 77 balls. Our seam bowlers struggled to maintain any sort of accuracy early and the introduction of the team spinners proved to be the turning point in the game. At 2/94 backs were hard pressed against the wall as spin twins Maxwell & McConnell were introduced. 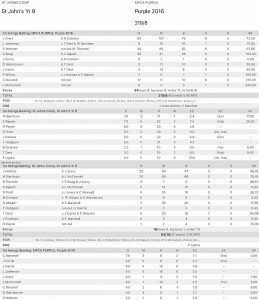 Lucas bowled beautifully for his devastating figures of 9-2-21-6 with Charlie bowling his 8 over’s returning 2/21 and it has to be said the initial over’s we bowled through light rain. The standard of our boys in the field was terrific and their team spirit was almost a 12th fielder. Sprits were high as the last wicket was taken to say the least and to date our boys remain undefeated. 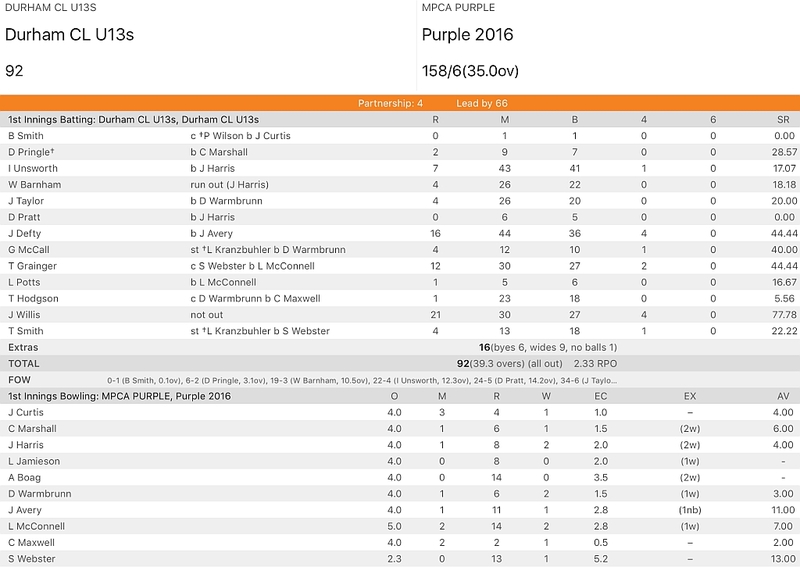 Result from Durham CL U13s vs MPCA Purple. This entry was posted in Uncategorized by Brad Hodgins. Bookmark the permalink.